I purchased the Fisher Price Space-Saver High Chair for my son at around 12 months of age. We live in a small Brooklyn apartment and do not have space for a standard high chair, and this one straps to one of our kitchen chairs, saving us a ton of space. He had previously been using a much older version (about 11 years older, handed down to us by family,) that he was decidedly destroying at mealtimes. This chair has been a life saver for us. 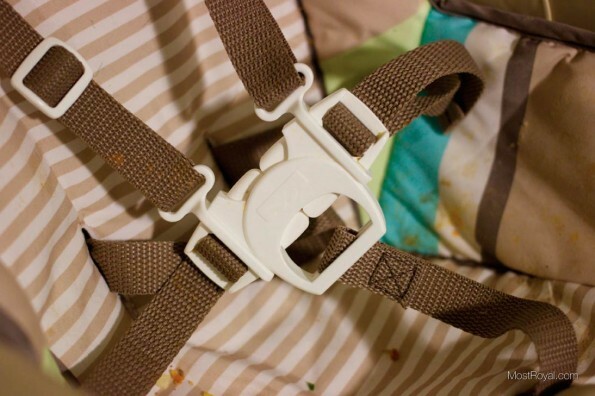 Mealtimes can be a headache, a mess and with the previous chair my son was able to literally rip it apart whenever he would get angry about the food I was insisting he eat. This chair is solid. The tray is solid too; it stays locked on and he can’t rip it off (yet…). AND this high chair has a FIVE POINT HARNESS. Which means he cannot get out of the chair! It’s like strapping him into a stroller. The tray requires two hands to put it on and take it off, but that’s ok. I will take that over having to pick it and all of my sons food off the floor. Note from Dad/Jeff: This seat was really easy to un-install and re-install from our kitchen chair when I needed to take photos of it for the website. 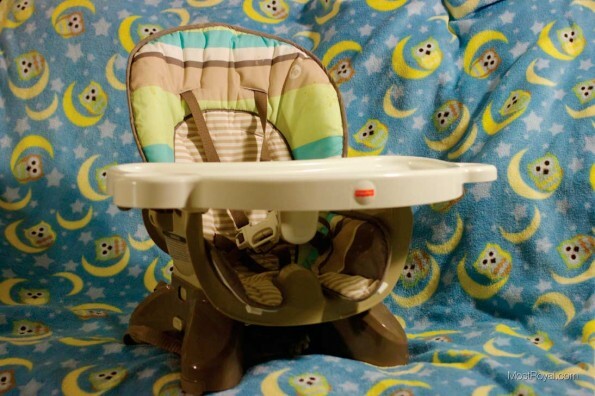 You can easily bring this highchair over to grandma’s, a restaurant, etc. Maybe this is overkill, but for a kid who does his best to squirm out of every high chair he encounters (restaurant chairs and the ancient chairs owned by family being the main culprits here,) this one holds up against his tirades. One thing I have not yet tested is how well the seat comes clean, and boy do I need to test this! [UPDATE BELOW] I do laundry once a week at the laundromat, it’s easy to forget the high chair as I am gathering and putting giant bags of laundry into a cart, and packing up my son with toys and lunch and anything else we might need for an afternoon at the laundromat, aaah… city life… In any case, I will update this review once I give the seat a wash.
5-Point-Harness and the chair fabric in need of a major scrub down. 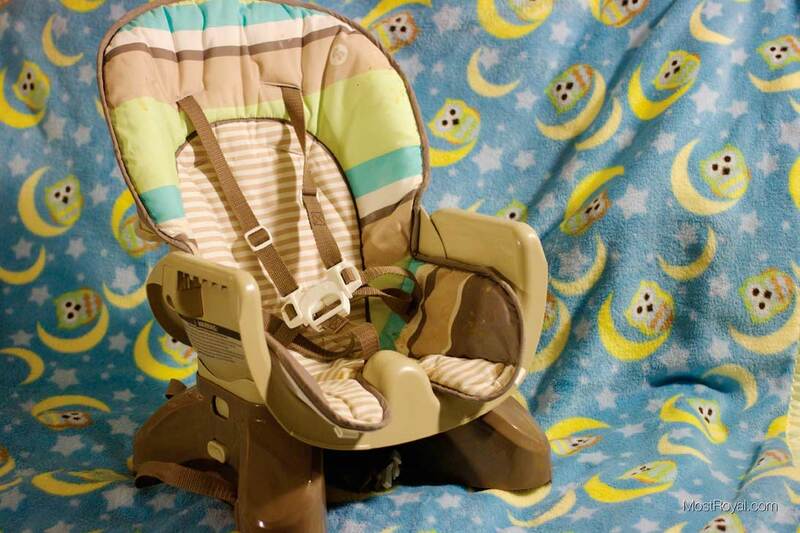 I give the Fisher Price Space-Saver High Chair a 4 out of 5 stars because as a stay at home mom, who is feeding my son most of his meals, I have found this chair to perform great for us. He can’t get out of it and he can’t rip the tray off, which is all that matters to a strung out Mommy! I will update this post once I wash the seat. Update: Since writing the above review of this highchair, I have washed the seat cover twice. The first time I sprayed the cover down with a stain remover shortly before washing and it came clean beautifully. The second time I washed it I did not use the stain remover and it still came perfectly clean! So I still stand by my originally rating.